Keeping the woodpile in the garage means that even in the most miserable weather, I have only to go a few feet to grab dry logs that will burn nicely. But it also means that on an August day, when I wandered out into the garage barefoot to begin cleaning the backshelves, I was not alone. All along the woodpile, little heads turned toward me, woken by the vibration of my footsteps or perhaps my scent carried across the warm air. As I was cleaning the garage, I tried to remember my students’ words. One snake stretched atop a log like a sunbather on the first day of summer. Another, clearly the shy younger sibling, curled in the corner, almost out of sight. “At least they keep the mice away,” I told myself. I kept up that line of reasoning even when I began sweeping underneath the shelves and came up with a dustpan of mouse droppings. I found myself tensing up just a bit as I sorted through stuff, even though I was pretty sure that snakes wouldn't climb the metal shelves. When I opened a box of snowboarding boots, I didn’t see any snakes, but it was filled with shredded paper that just might be a mouse’s nest. I carried the box in, set it on the table, and promptly forgot about it. That turned out to be a mistake as I discovered several hours later. With-a-Why, sitting at the couch with his computer, noticed it first. “I think I just saw a mouse run across the room,” he said. “How could that be?” my husband asked. “We have FIVE cats.” Three of the cats, in fact, were in the room, stretched out comfortably on the carpet. Then I noticed some movement on the kitchen table. A baby mouse ran to the edge of the table, looked down, then ran the other way. Another mouse peeked out of the cardboard box. Another little mouse had reached a wooden chair and was heading to the floor. I yelled for my family to help as I began scooping baby mice up and tossing them out the back door. 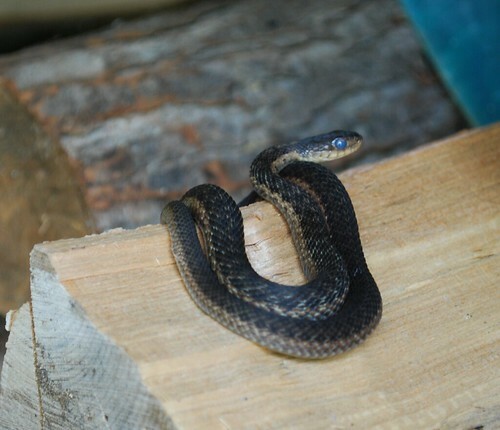 The five cats in the house and numerous garter snakes in the garage? They did nothing. With my body still on east coast time, I woke up at dawn. The sun hadn’t yet appeared over the mountains, so the long beach outside my window was in deep shade. I pulled on some clothes, grabbed my camera, and went out for a walk. It was colder than I had expected. The soft sand I stepped into felt more like snow. It looked like snow, too, the way it was sculpted into shapes by the wind. Waves rolled in, the white foamy crests striking in the early morning light. I turned north to walk up towards the big rocks that make an arch. I had the whole beach to myself. I didn’t see another person although I did find a sand castle built yesterday and evidence of an evening bonfire. I wandered up the beach, happily taking photos, sometimes wandering in the water to get just the right shot. I didn’t really have enough light yet for good photos, but I didn’t really care. Having a camera in hand just makes me notice how beautiful everything is. I was glad, as I walked, that I was wearing a warm fleece, and I began to regret the decision to go barefoot. The sensations in my feet were painful at first, and then they began to go numb, so that it was as if I was dragging along these heavy blocks of ice. “As soon as the sun comes across the bluffs, the sand will get warm,” I told myself. I kept looking hopefully over to the string of beach houses to the east. I turned back towards my motel, wondering how far I’d gone. I’d been out for at least an hour. I knew it was getting later because I saw another person on the sand, a woman walking a dog. I looked enviously at the sneakers and thick socks she was wearing. By then, I was feeling eager to get back to my warm room. Just one problem. None of the buildings along the shore looked familiar. I remembered that the motel was built of weathered grey wood, but that described almost every building I saw. In my wanderings, I’d been so focused on the ocean that I hadn’t looked towards the shore, and nothing I was passing looked familiar. Maybe I’d already passed the motel. My feet were so cold that I probably looked drunk as I stumbled along the cold sand. Just then, the sun finally crept past over the tallest bluff, sending rays of light across the sand. I saw a sand castle in front of me — the same one I had noticed earlier! That meant I was right near my motel. With relief I stepped onto the sunlit sand. Already, it felt warmer. 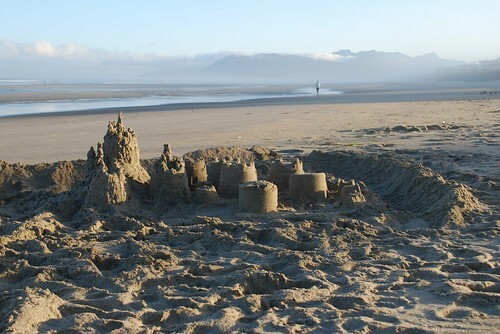 I sat down in the sand to take a photo of the castle and absorb the sun as it spread across the beach. 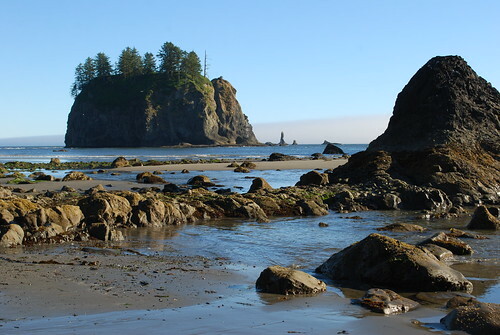 My husband and I are traveling slowly down the west coast, taking the time to explore beaches, stop at lighthouses, hike rocky trails, and stay a couple nights in each beautiful place we find. Last summer, we cancelled our vacation when his mother went into the hospital, so this year we decided we deserved two weeks instead of one. Besides, our 30 year wedding anniversary is this month, and we figured a relaxing vacation would be the best way to celebrate.